We have received the email below about this year’s Leiden Summer School in Languages and Linguistics. It looks rather tempting–as well as Russian Literature you can do (for instance) Lithuanian and Church Slavonic. Those who are interested can see my reminiscences of 2007 here. 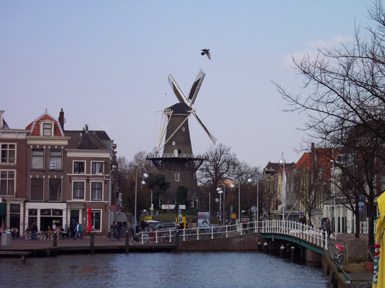 We are happy to announce the sixth edition of the Leiden Summer School in Languages and Linguistics which will be held from 18 July – 29 July 2011 at the Faculty of Humanities of Leiden University. The Summer School offers a number of courses on a wide range of subjects in the field of languages and linguistics. For more information and registration, visit: http://www.hum.leiden.edu/summerschool/. Yes, it really does look like that! For more information and registration, visit: http://www.hum.leiden.edu/summerschool/ . Now we’re reaching the heights of unreality of course–like a city with poems in foreign languages painted on the walls of the houses. So for the past four years there has been a Summer School in Languages and Linguistics in Leiden. While the focus of this varies from year to year, there are usually courses on Indo-European, Sanskrit and Russian Literature (among many others). I went in 2007 and it was very interesting–I did courses in Indo-European Phonology and Morphology, Indo-European Origins, and Russian Literature. It was basically aimed at first-year graduate students (the director, Sasha Lubotsky, told me it was meant to compensate for the decline in Indo-European studies in Germany and the effects of the Bologna protocol), but there were some…older…people doing Russian and Sanskrit mainly as I recall. And there’s a 1-year MA in Comparative Indo-European Linguistics if you’re really keen, while you can find a site dedicated to Leiden poems-on-walls here. OK, so let’s have some more detail in an attempt to be helpful. There were four timeslots of 90 minutes each, each one corresponding to one course, with time in between for coffee/tea and lunch, so the day lasted from 0930 to 1730, and there were quite a few lectures/activities in the evenings. I did three courses, as I’ve said above and as I thought was advised, but lots of people did four. 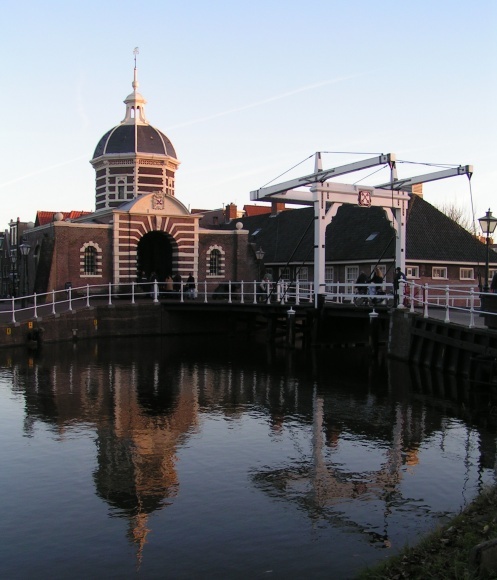 I arrive at Leiden station and go to the Leiden University Visitors’ Centre. Alwin isn’t there, but when I go back 15 minutes later he is. I get a key to Hugo de Grootstraat 32 and set off to walk. When I get there, I can’t see any card-operated lock. After a long period of desperation, I realise that the main door isn’t locked, so I manage to get to what is a very large underground studio by waving the card. I start to fill out the inventory, somewhat confused by the dual functionality of many things (the locker for instance doubles as the headboard of the bed–that’s how you make space in a country like Holland). In the evening, I set off for the reception; I manage to find ‘de Groote Beer’ but not the reception! I find a useful supermarket by the station as well. After we have managed to get into the building and Alwin has scolded defaulters from the reception, we have Jim Mallory on Indo-European Origins (once someone has got the computer to work) and jolly interesting it is too. There must be 50 or so people for this one! In the afternoon, it’s PIE Morphology and Phonology with 25 or people and then ‘Stalin Terror in Russian Poetry’, where everyone else seems to be Dutch speakers, and they do break into Dutch from time to time. Jim Mallory announces he is breaking us up into teams, and a not very numerous ‘Team England’ is formed. At coffee, we worry about our PIE homework from yesterday. Prof Lubotsky goes through the exercises in the afternoon and when in the discussion of Akhmatova I say there is a star in Revelations Mrs Lubotsky says that I should have more to say for myself. The non-Dutch presence doubles with the arrival of Jeremy. Jim Mallory says the presenters from the different teams have more-or-less covered the necessary points between them. Yesterday’s PIE homework turns out to be as easy as it seemed. We finish going through Реквием and read the end of it in unison. We start Поэма без героя and I disagree with Mrs Lubotsky about Greek tragedy. Discussion ensues. At dinner, people complain about the repeated testing in US graduate schools. Beth says it sounds like the kind of life for her. I point out that Jim Mallory can’t really do a chi-square test with expected frequencies < 5 and he says he has 672 cells and no significance anywhere. Interesting PIE in the afternoon–we get on to de Saussure and his coefficients sonantiques. Mrs Lubotsky tells me they are going to consult the Professor of Greek on Sophocles’s views on the individual and society. A very interesting lecture on ‘BMAC and its language from Prof Lubotsky in the evening. I wander round Leiden and buy a couple of books. Prof Mallory displays some worryingly unstructured data. I turn out to have got 4/20 in my PIE homework. Russian poetry is quite fun, apart from Jeremy having disappeared. Lecture on ‘Coping with words, ideas and things’ in the evening–is he talking about natural kinds or something else? Prof Mallory gets us to discuss how to change the language of Ireland from English to Japanese, adding that he knows how poor the response can be on the basis of his students in Belfast. More unsuccess with PIE Homework. And then pretty interesting Mandel’shtam (Jeremy has reappeared). Lecture on ‘Ancient Egyptian Pyramid Texts’ in the evening. The Italian girls put forward the Roman Empire as a model for IE language dispersal ‘after a night of sleepless scientific work’ and in the alternative suggest that the Proto-Indo-Europeans were just better looking. The American lad sitting next to me puts forward the warrior band/priestly caste model, after which Nina for the Slavs agrees and also wants to say something about the position of women. I have a headache during Professor Lubotsky’s lecture, while in Russian I offer a talk <<По просьбе учащихся–о греческой трагедии>>. Jeremy and I go to look at a sofa he is buying. Sessions pass. Frans tells me we are going to buy Mrs Lubotsky a book of Flemish poetry and I cough up 4 euros. Jim Mallory gives a jolly good talk in the evening. Jim Mallory springs a surprise at the end of his lecture, claiming a recent date for European languages apart from Greek and wanting to know what the linguists think–they don’t, or not openly. I can’t find any overview of Greek drama in the library, so write down my own ideas in Russian. Prof Lubotsky entertains us with a reconstruction of shin-bone in PIE and its dissimilation from shank. He gives us each a copy of his inaugural lecture (in Dutch). I give my talk on Greek tragedy in Russian, saying it was not Greek and not tragic, and people appear interested. We pretend to sing along to Gorodnitsky and Galich. Lena gives us a DVD of Love’s Prayer in Dutch. We give her a book of Willem de Korning and a photo album. At dinner we talk about favourite Greek authors and which Russian leader spoke the worst Russian. The normal anticlimax of going home is a bit painful!